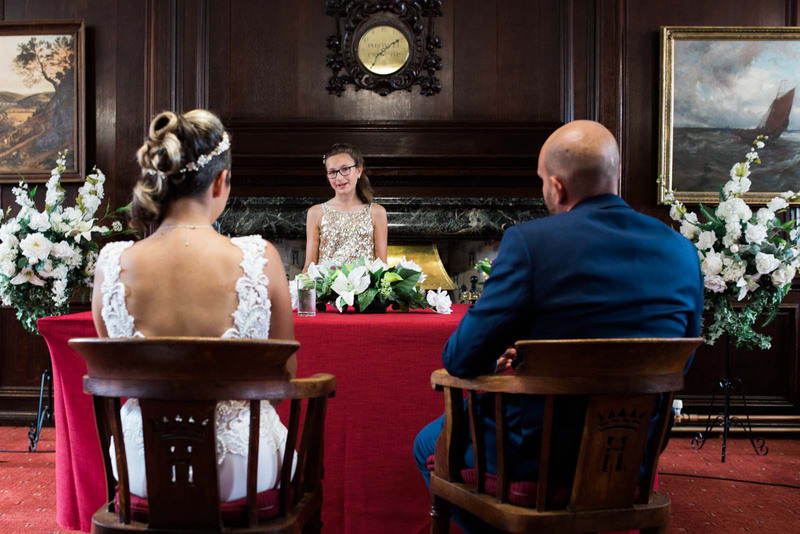 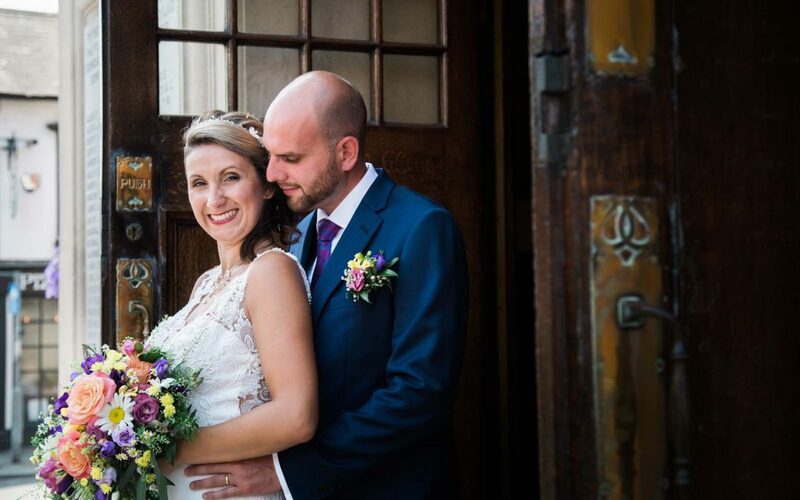 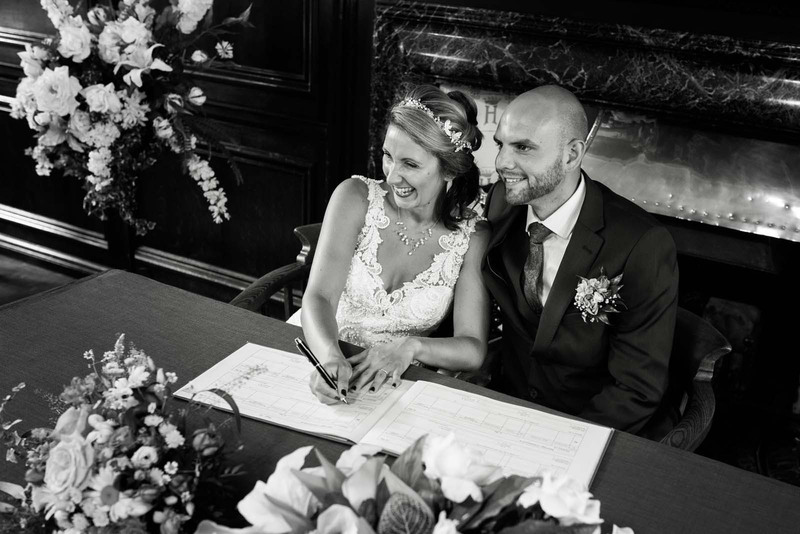 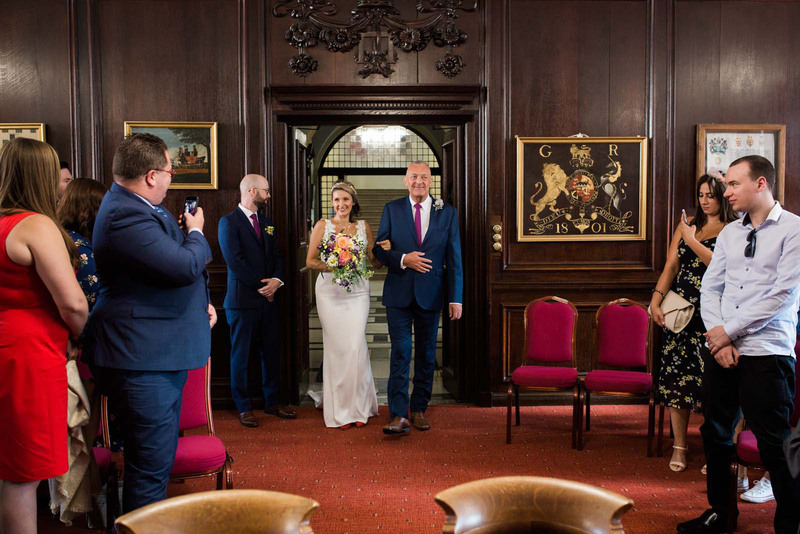 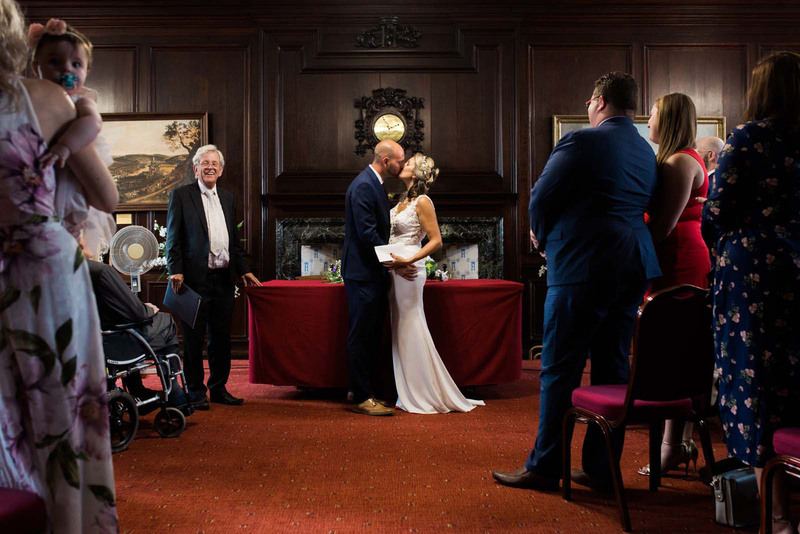 Paul and Tara tied the knott in the Town Hall at Henley-on-Thames. 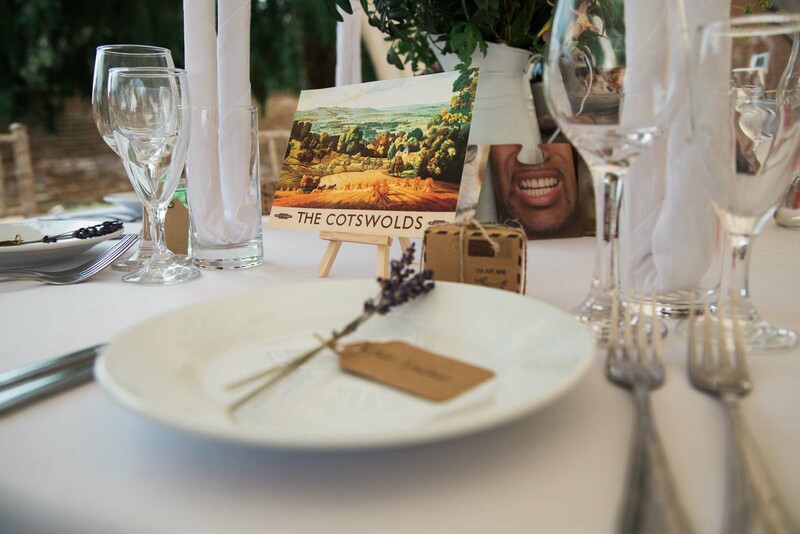 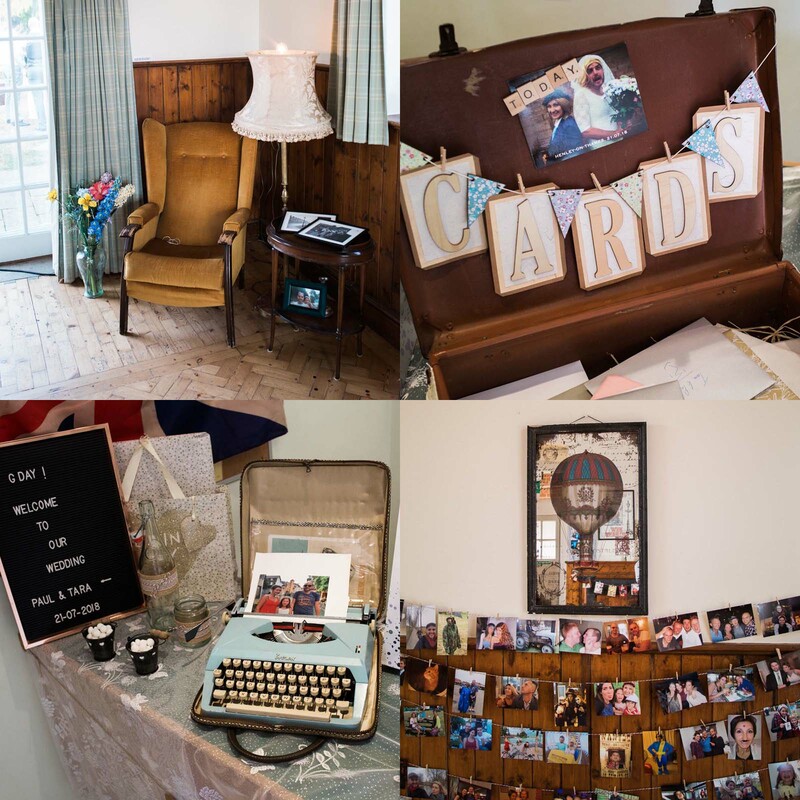 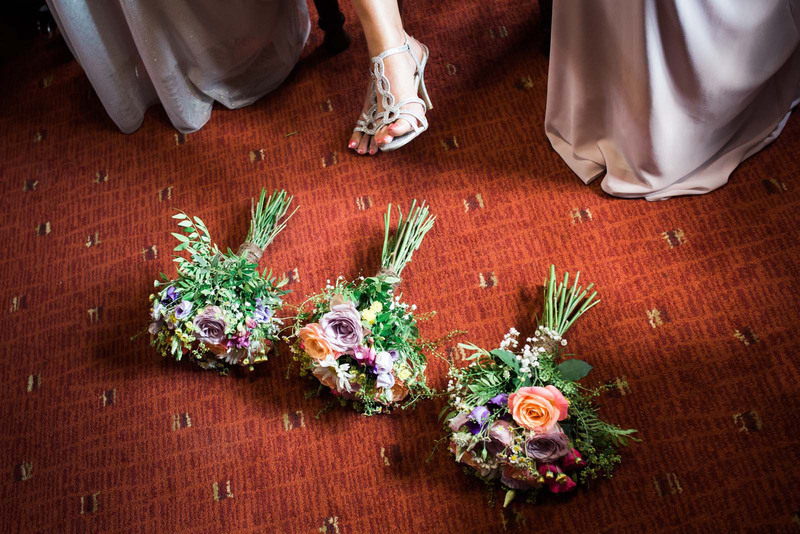 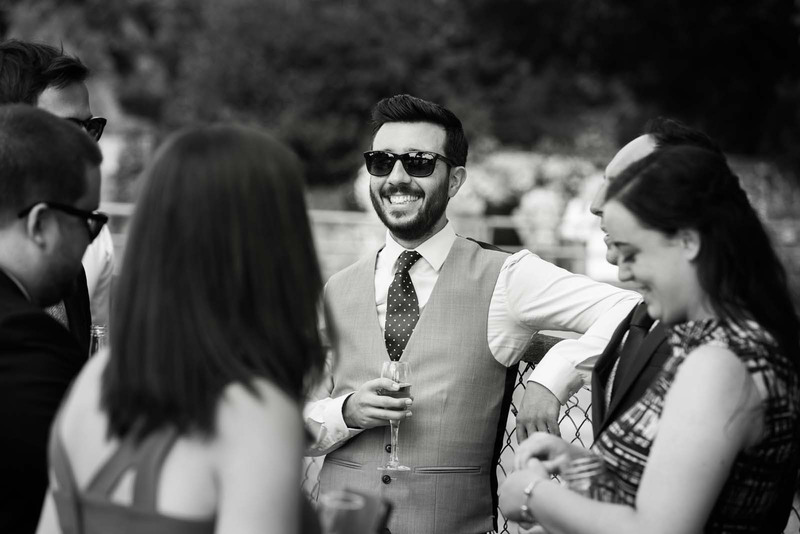 Every detail of the wedding was vintage inspired and planned to create a fun atmosphere. 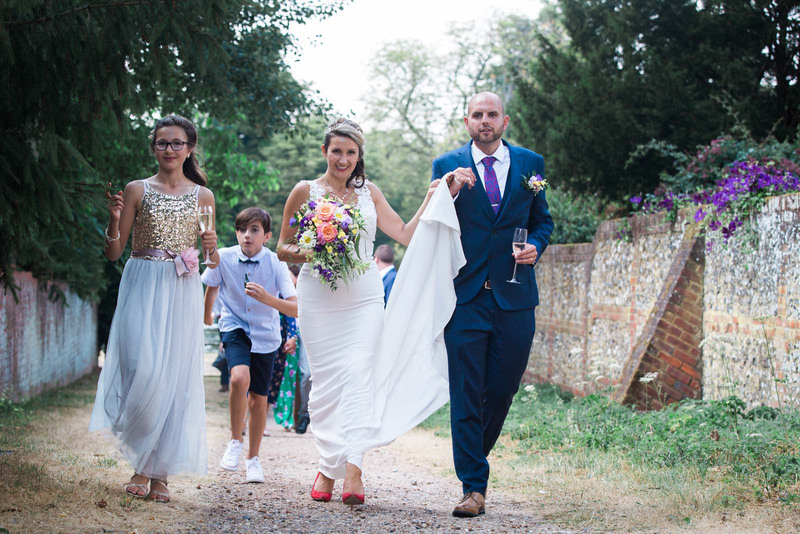 Tara looked stunning in her figure-hugging dress, red vintage shoes and matching lips. 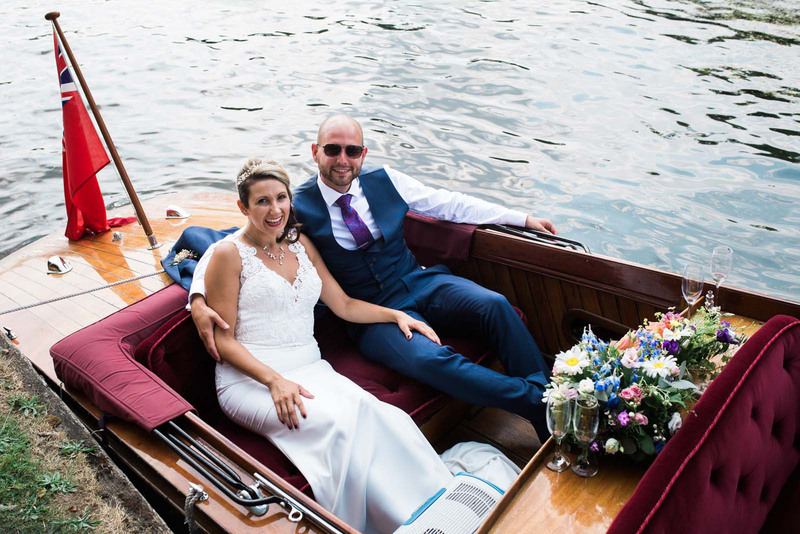 The couple enjoyed a romantic boat ride on the river thames on board Jobelle, a 25ft Andrews slipper. 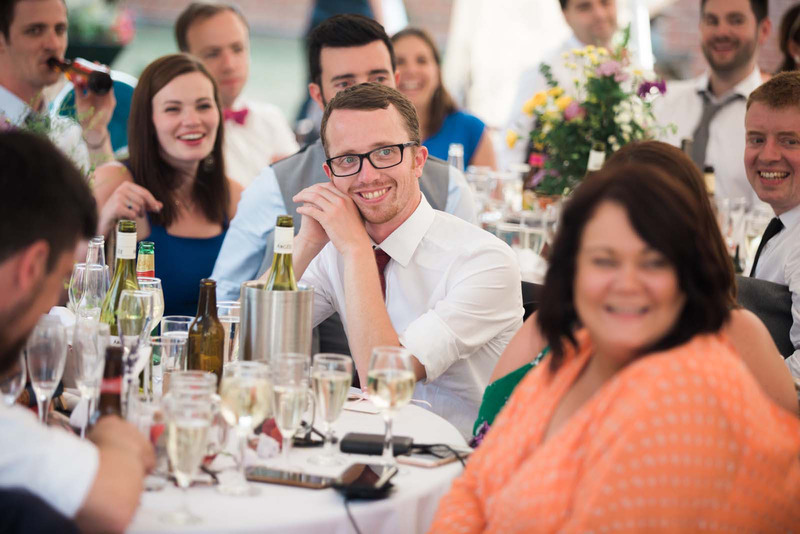 The luxury charter is painted in the typical white livery with contrasting wooden decks. 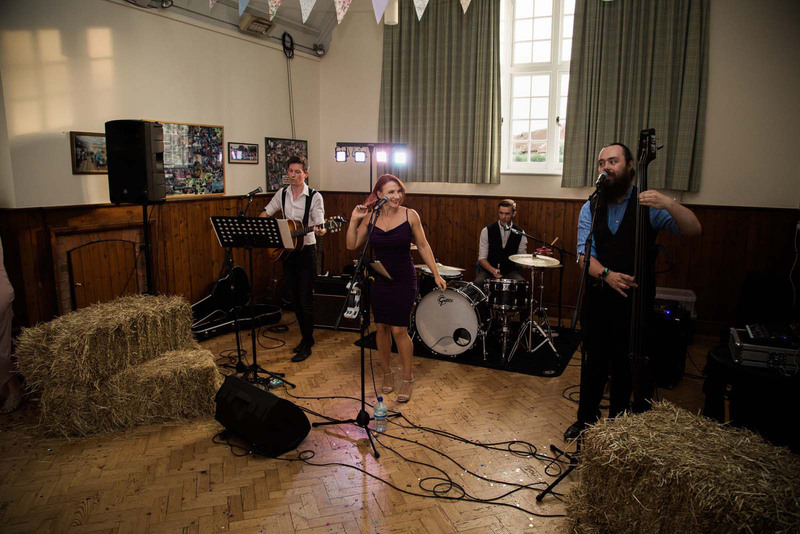 Meanwhile guests traveled to the Remenham Parish Hall on board Rocky the Routemaster. 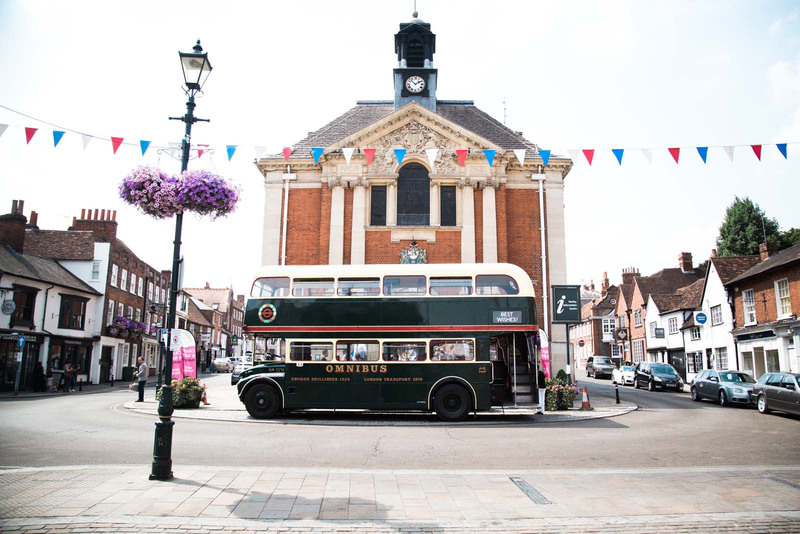 The vintage RM2208 bus celebrated it’s 50th year in 2015. 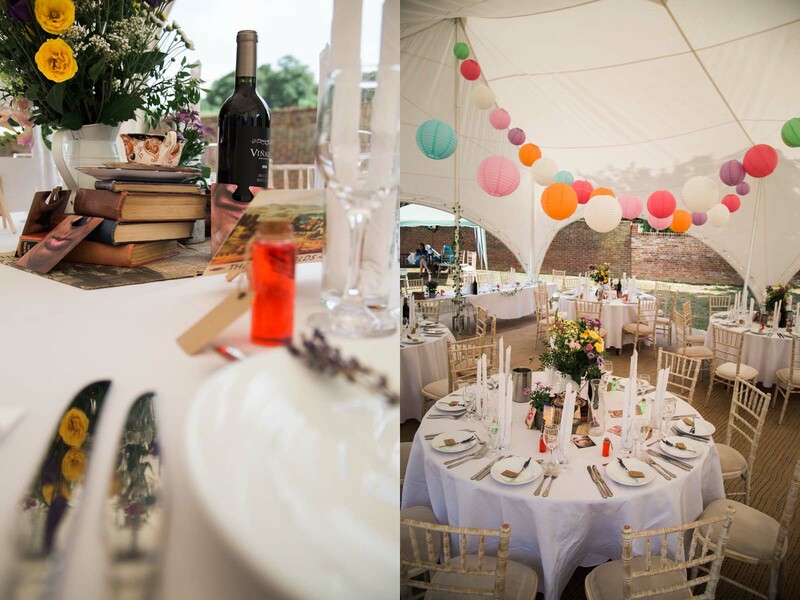 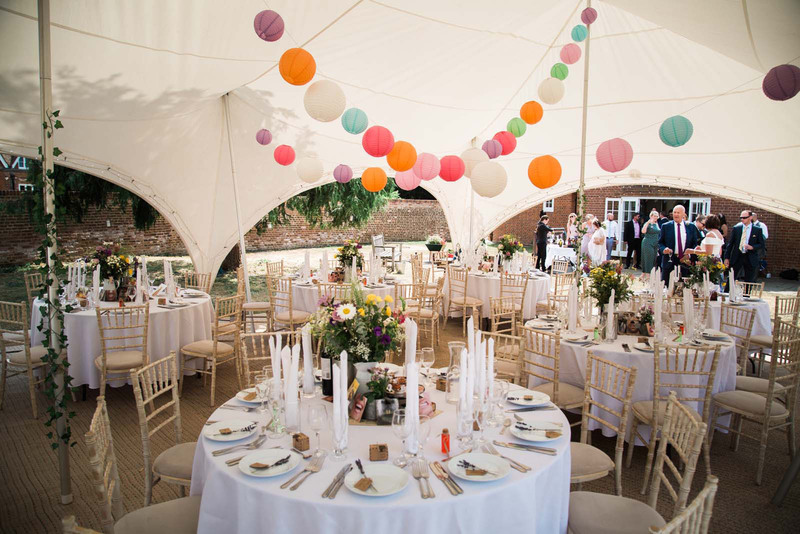 The couple decorated the marquee with wild flowers, lanterns and lovely little details. 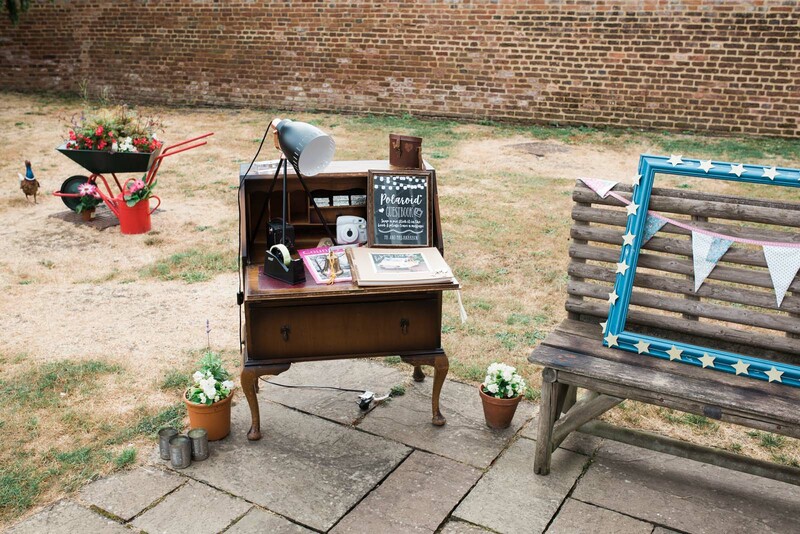 Everywhere you looked were fun and characterful art installations. 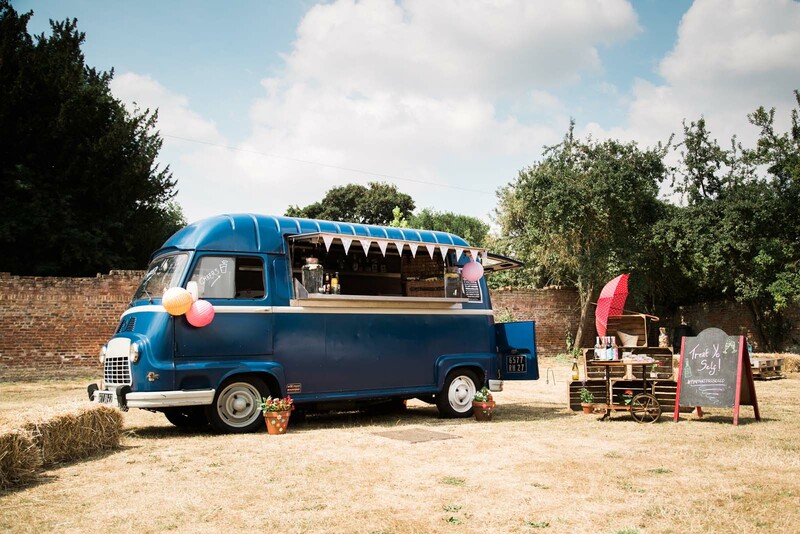 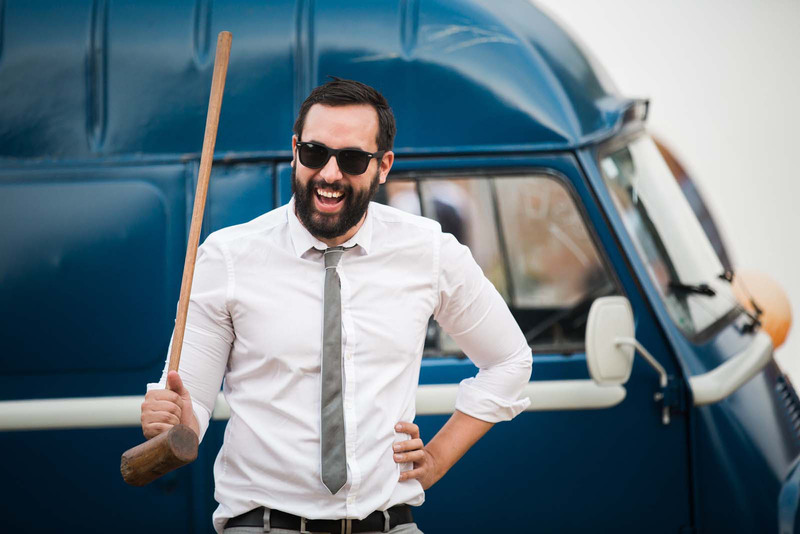 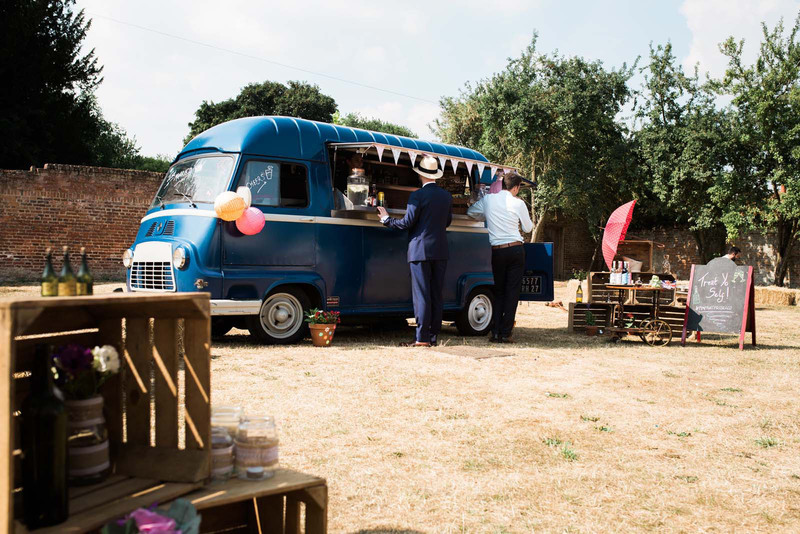 One of the vocal points was the bar – a blue van supplied by The Vintage Bar Company. 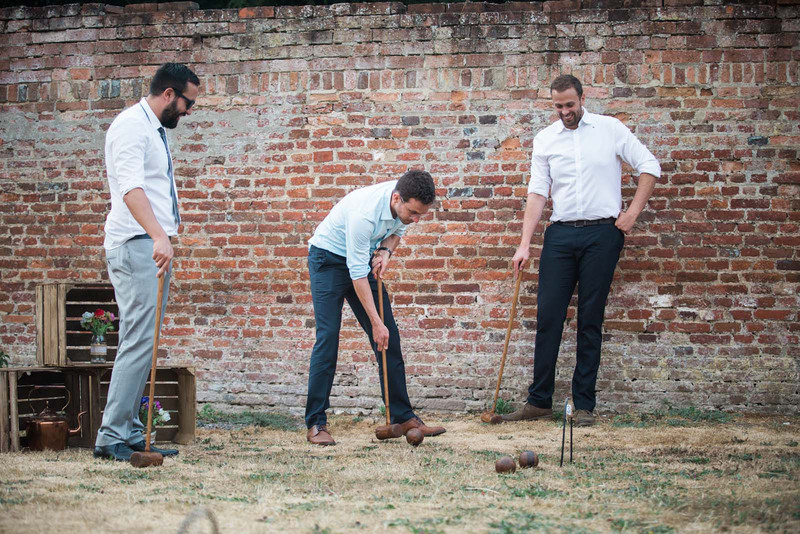 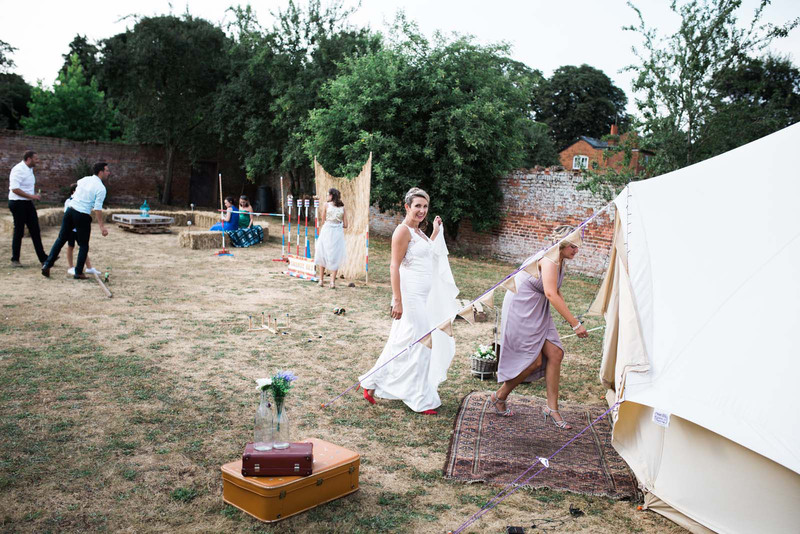 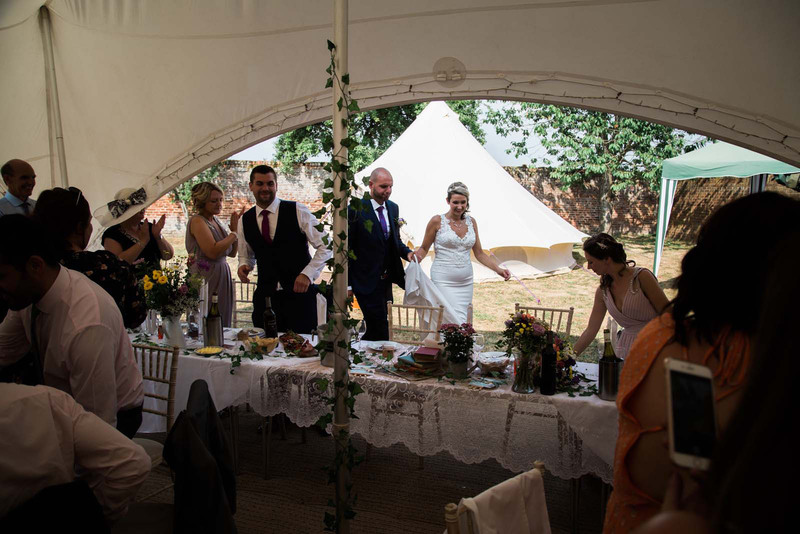 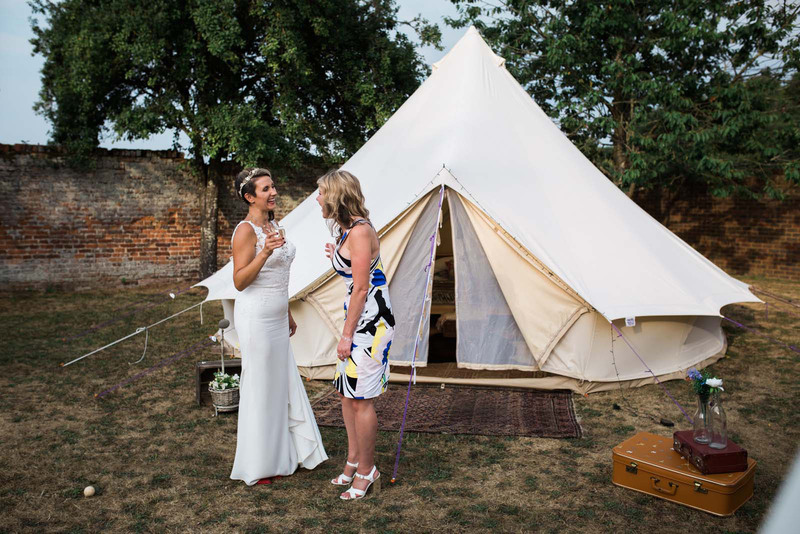 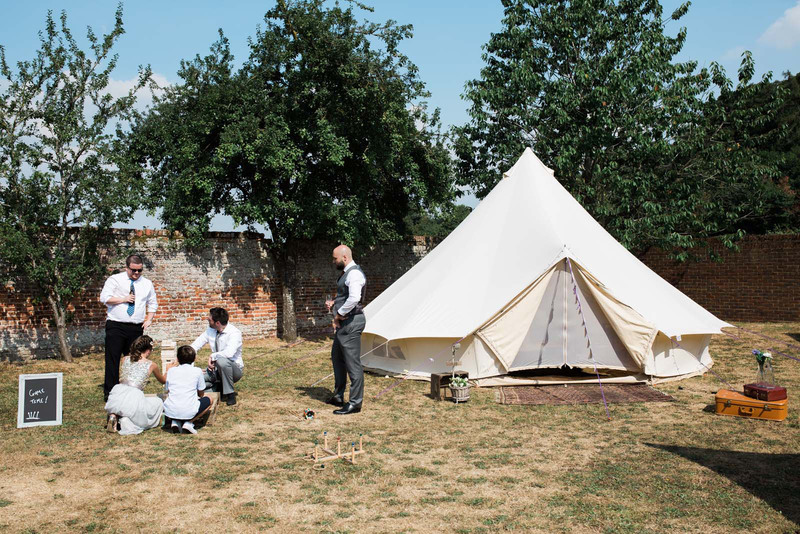 There were plenty of garden games to keep guests entertained and a bell tent as the honeymoon suite. 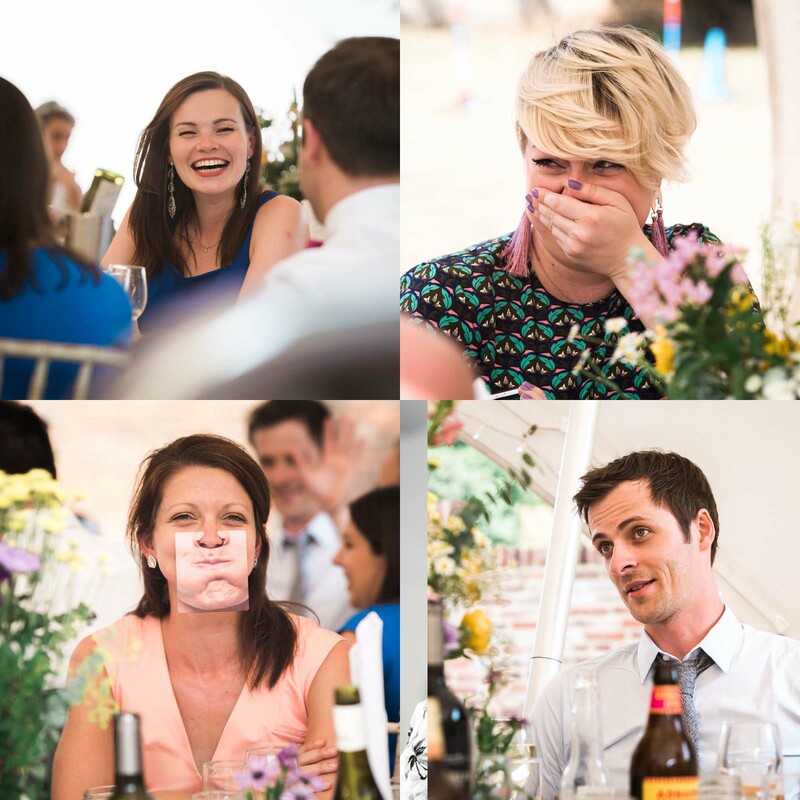 To say this wedding was fun would be an understatement. 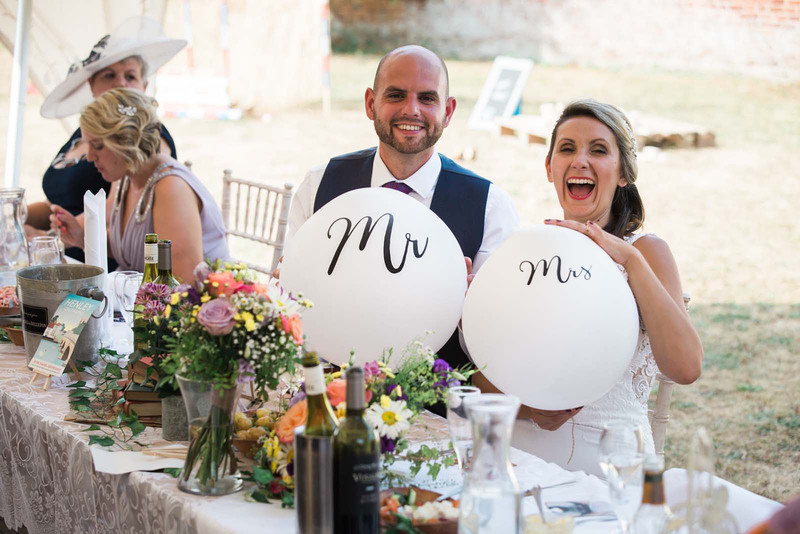 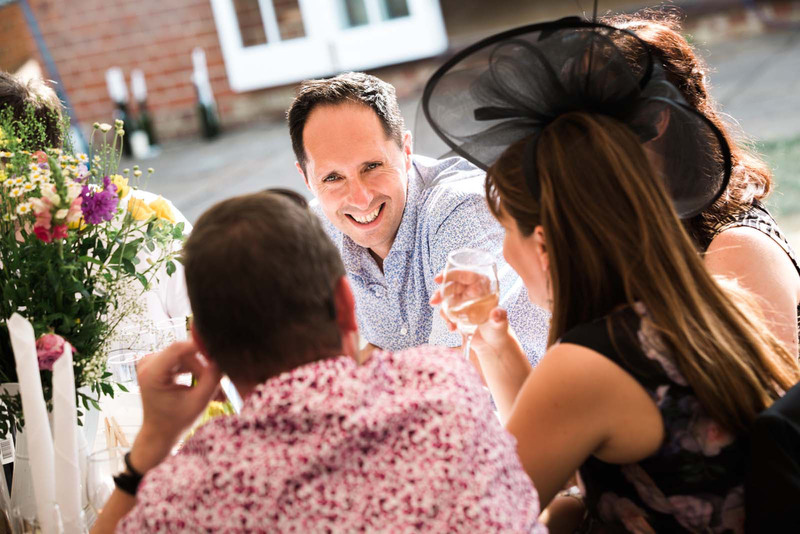 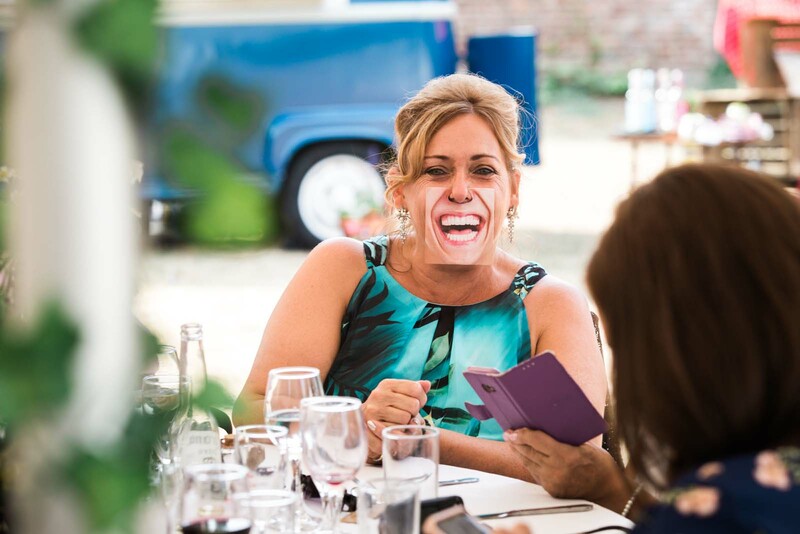 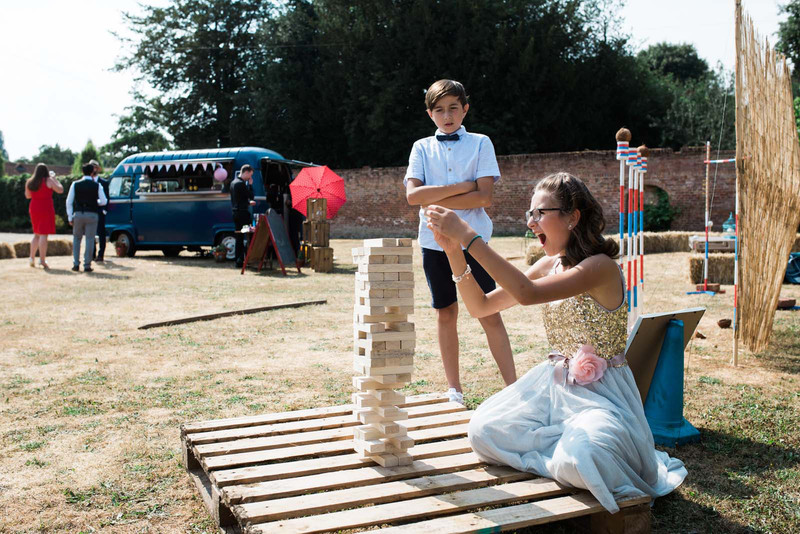 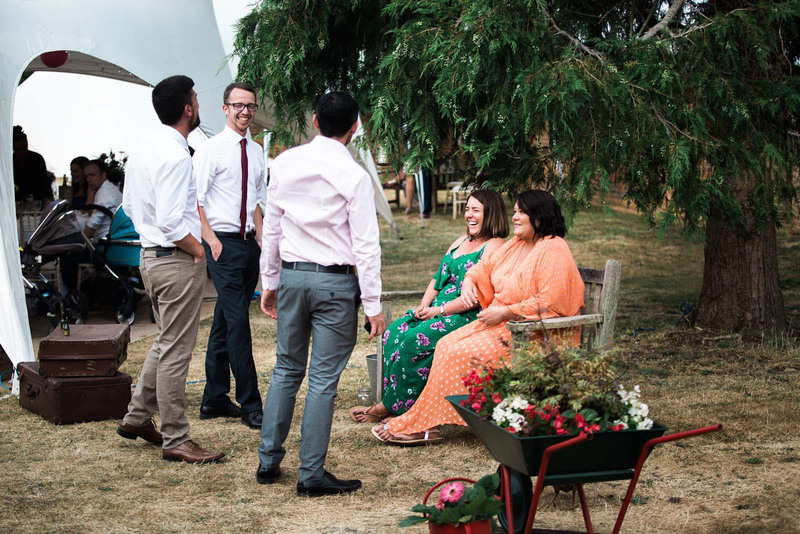 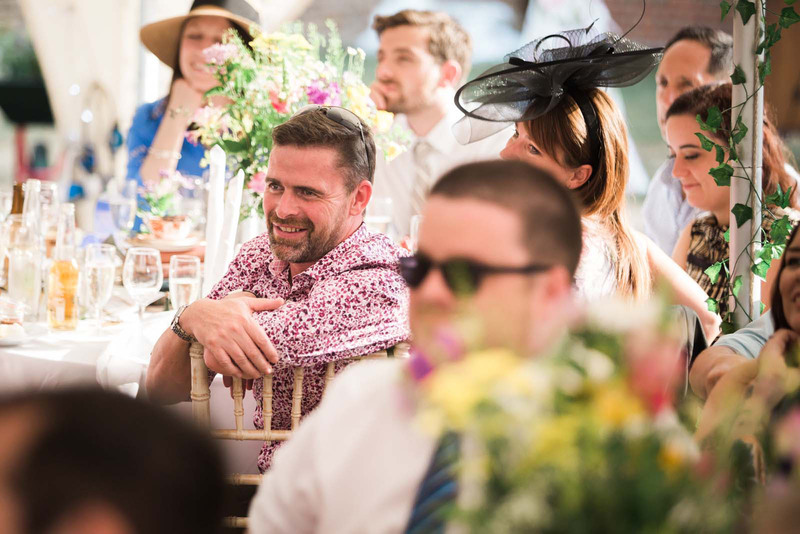 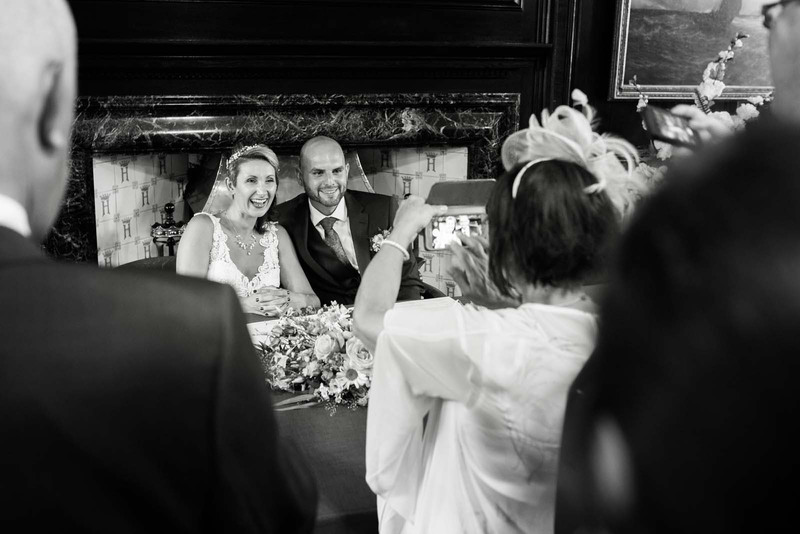 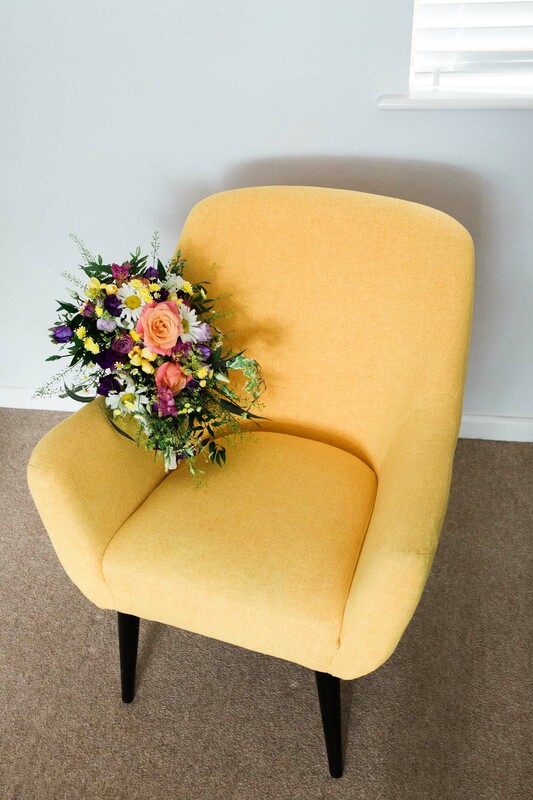 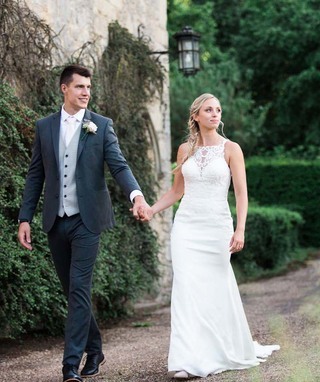 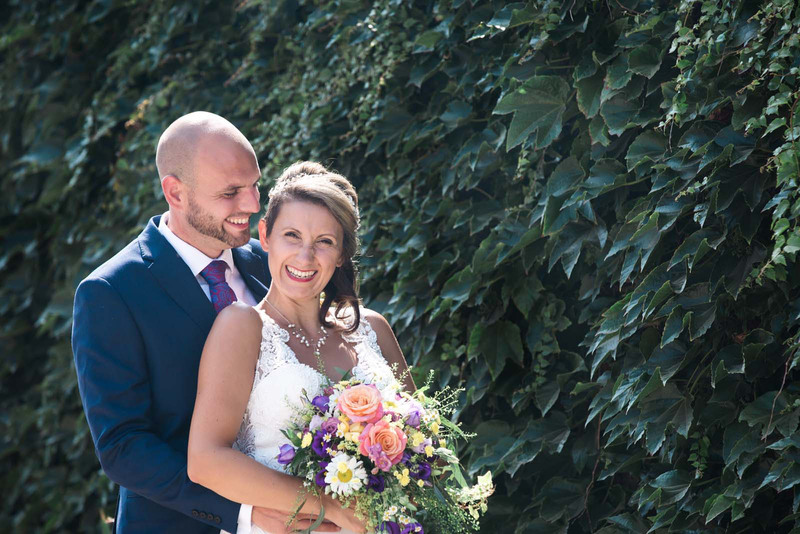 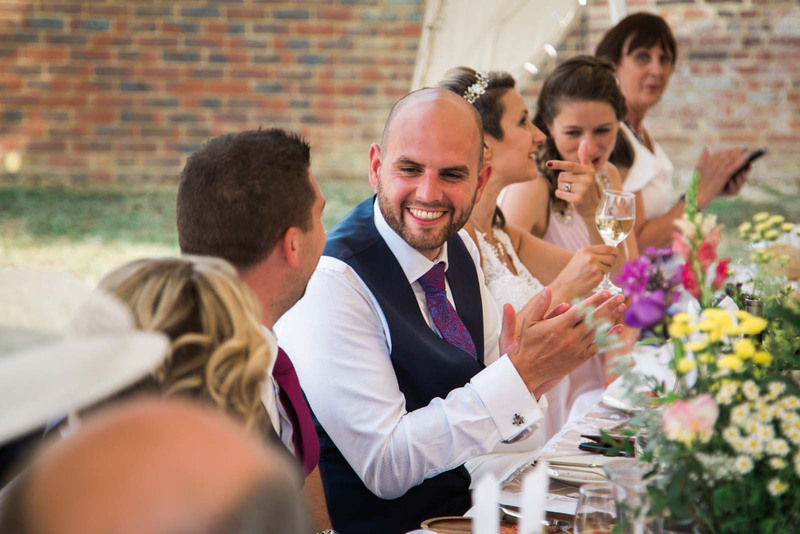 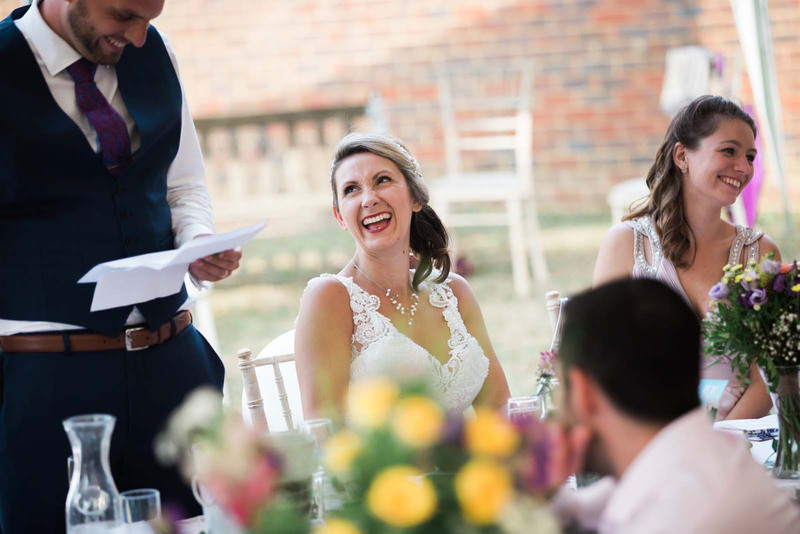 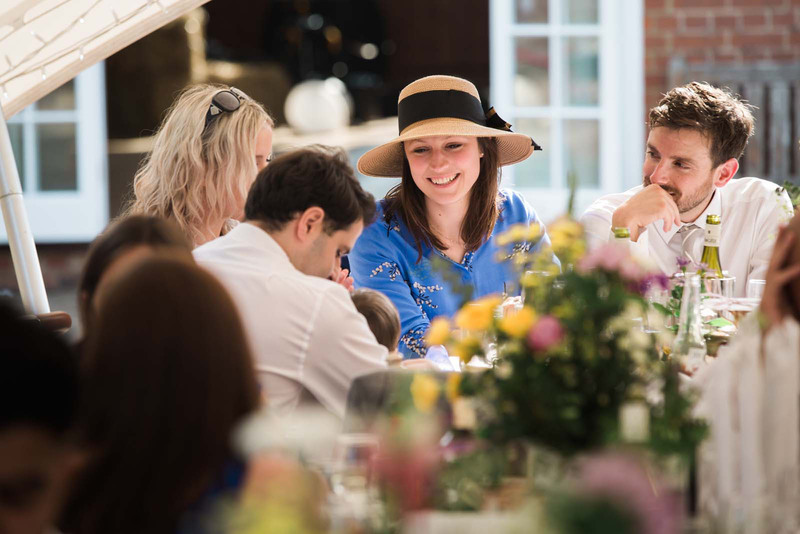 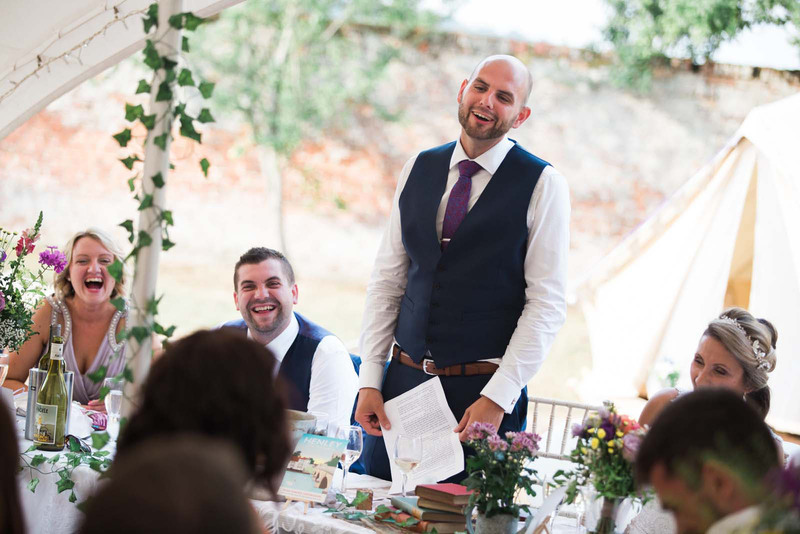 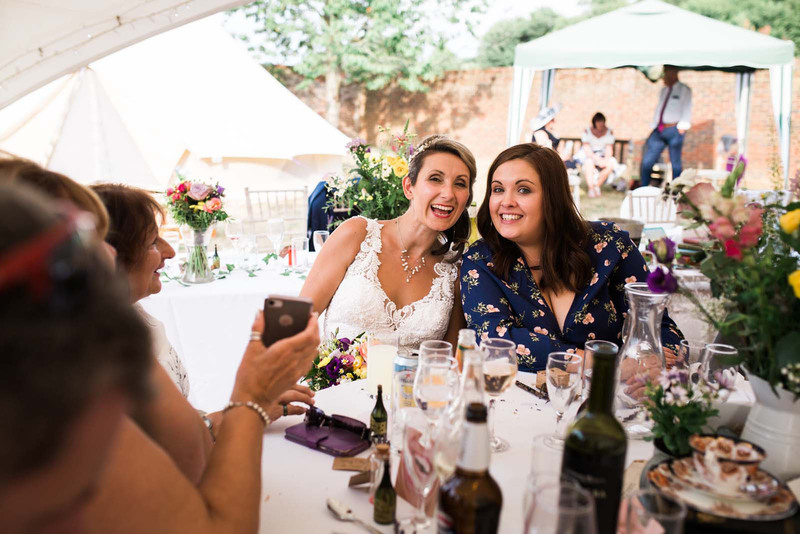 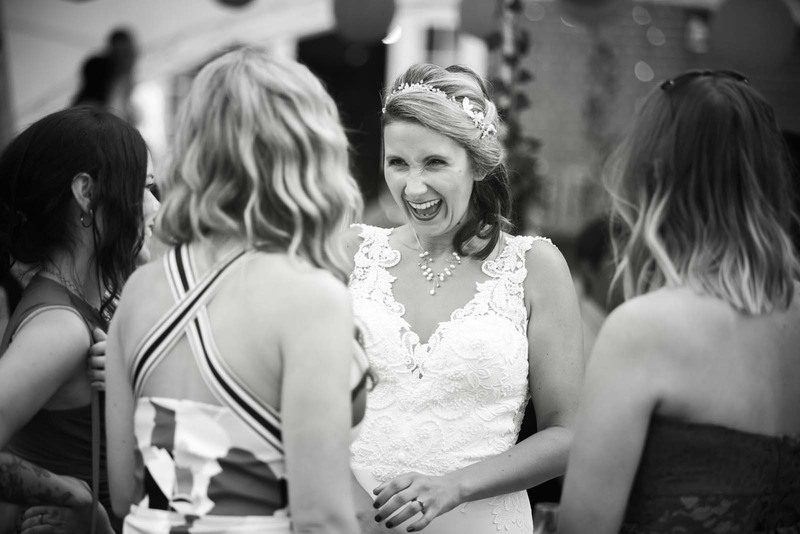 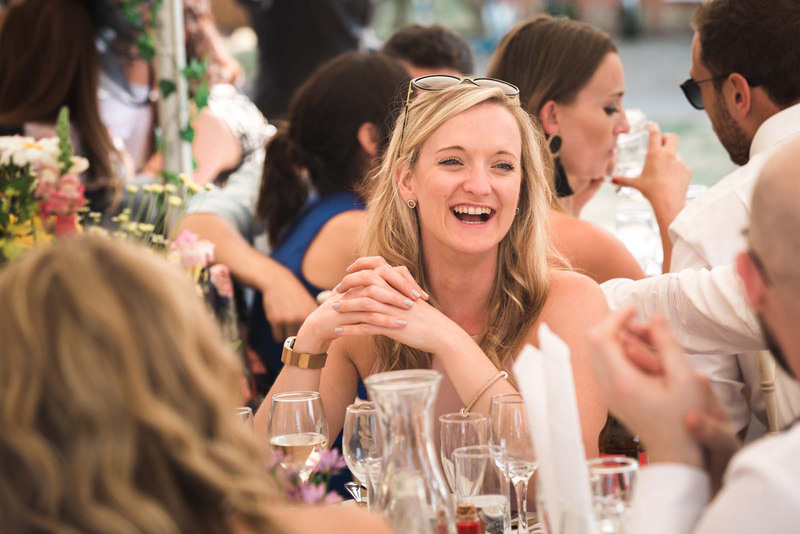 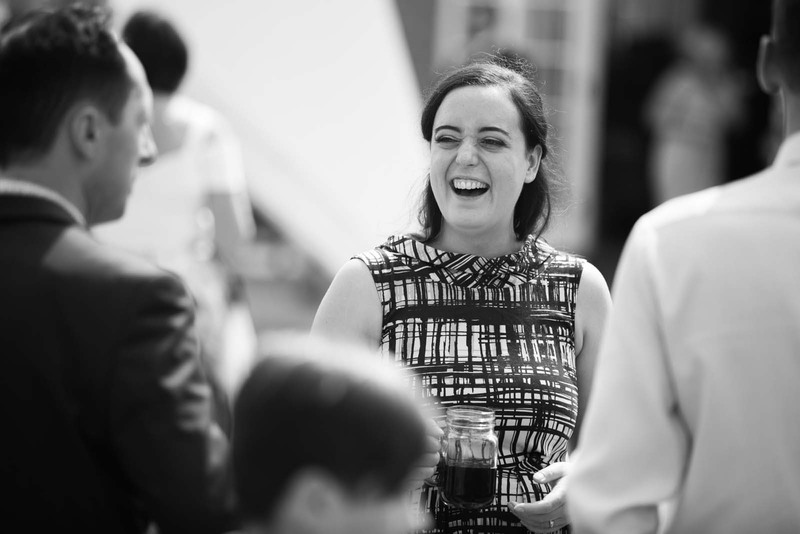 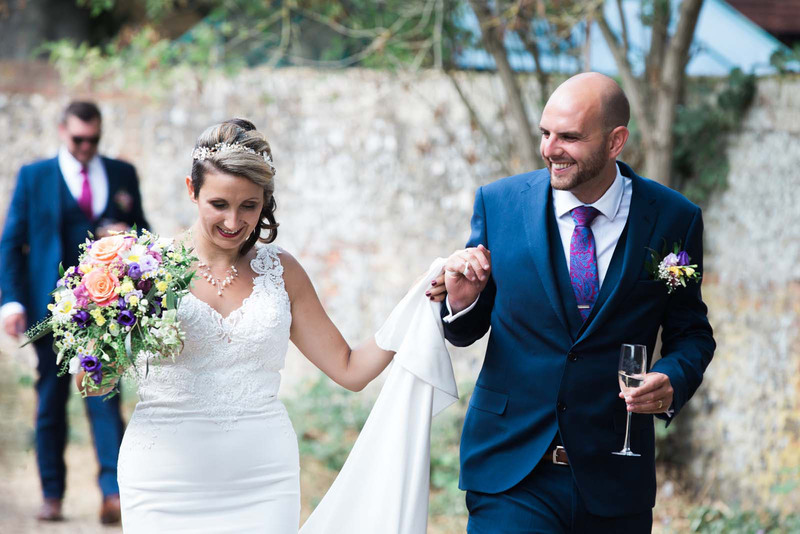 Tara and Paul managed to create a wedding festival with music, games and plenty of laughter. 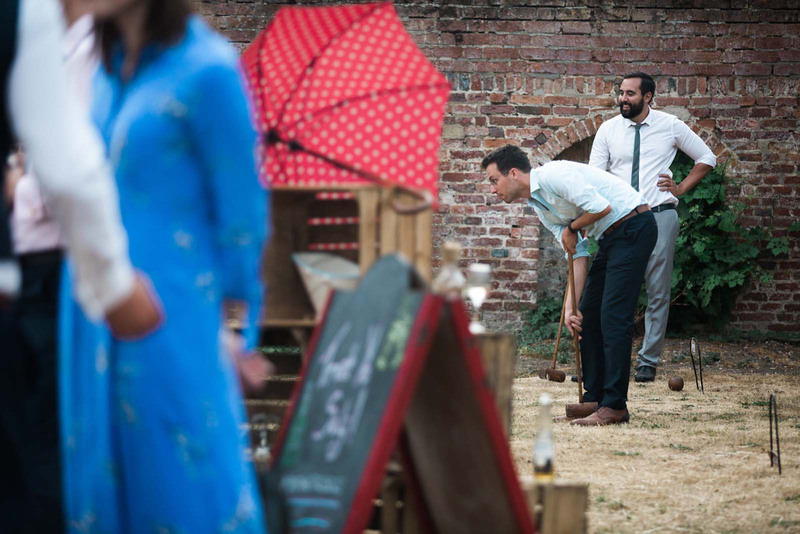 It was great to see everyone engaging in the activities and having fun. 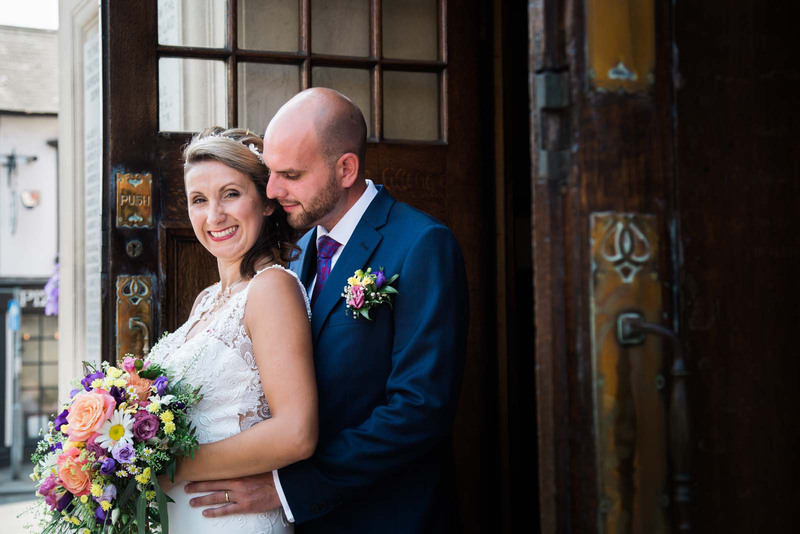 Thank you Tara and Paul for asking me to photograph your beautiful wedding. 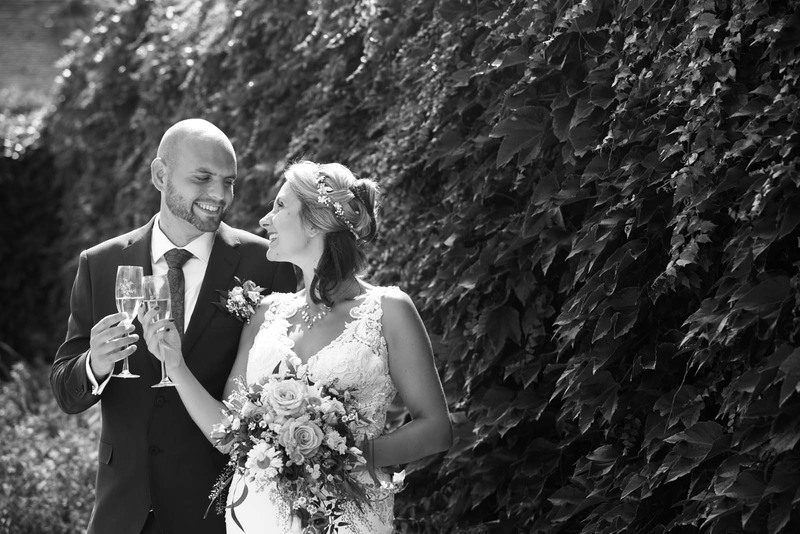 It was clear to see how much thought and effort you’ve put into the day. 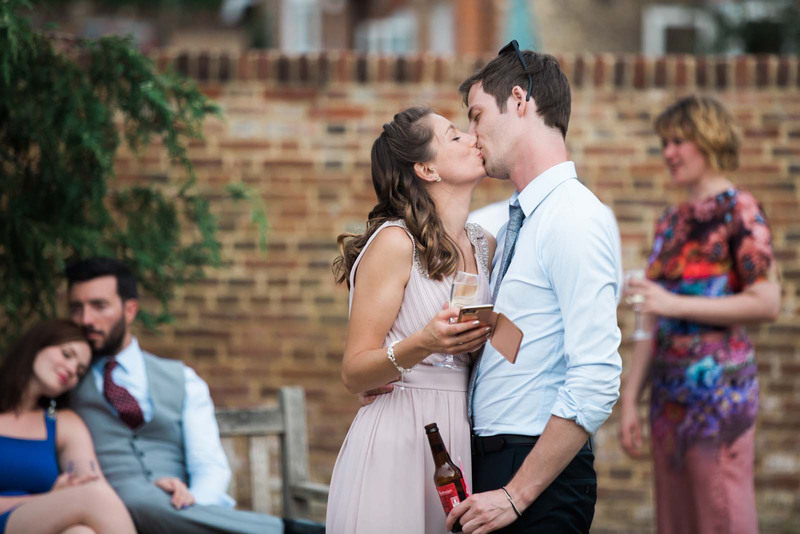 It definitely paid off! 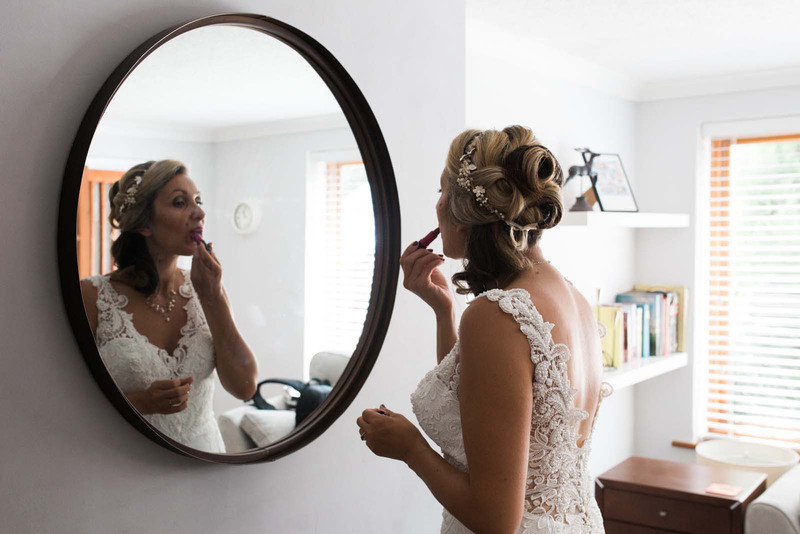 I was so inspired and had so much fun photographing the day. 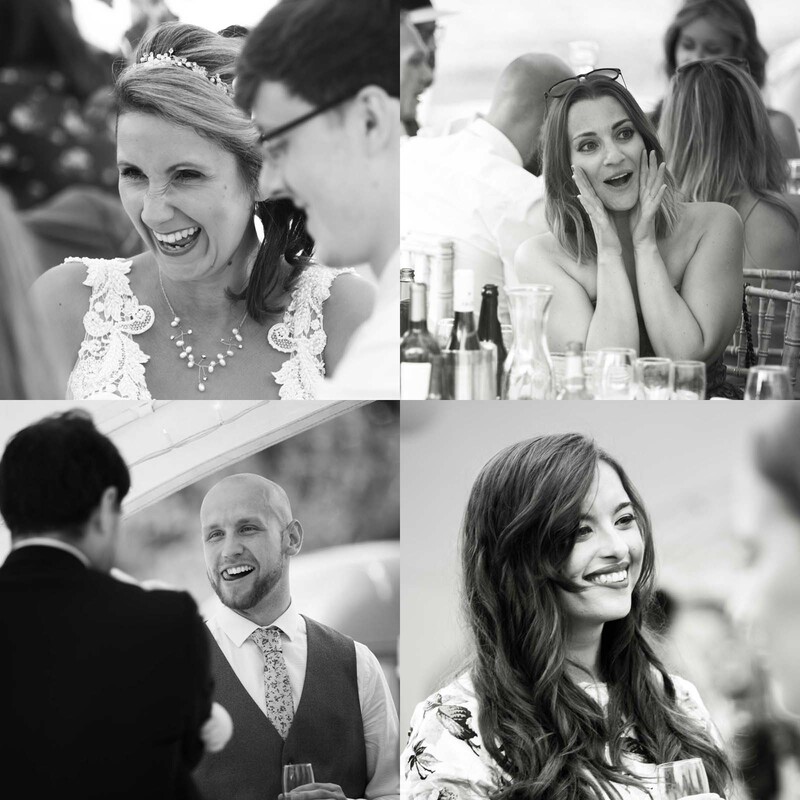 Here are my five top picks. 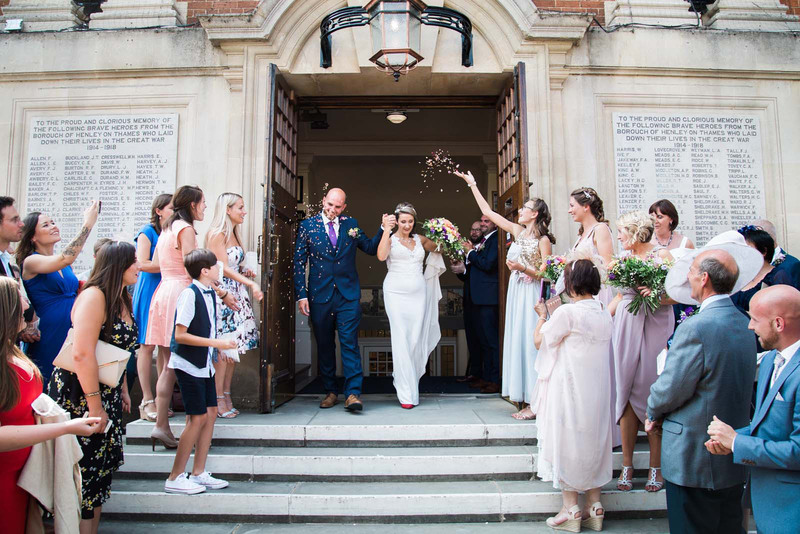 I just love the movement in this confetti shot. 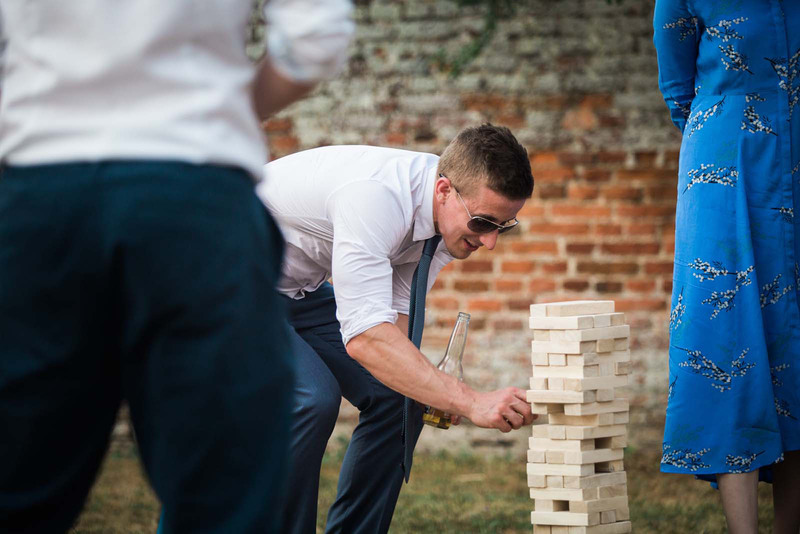 Another firm favourite is the pure surprise and delight on the face of the young guest playing jenga. 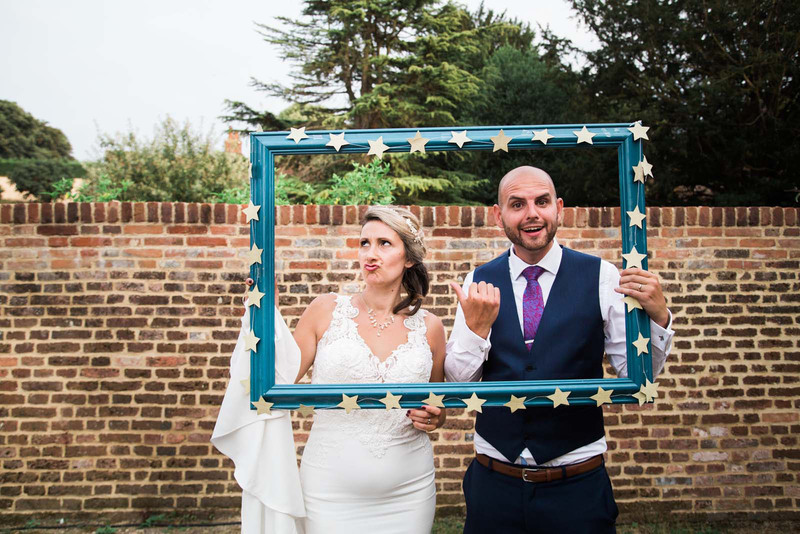 I also love the fun shot of the Bride and Groom with the DIY frame. 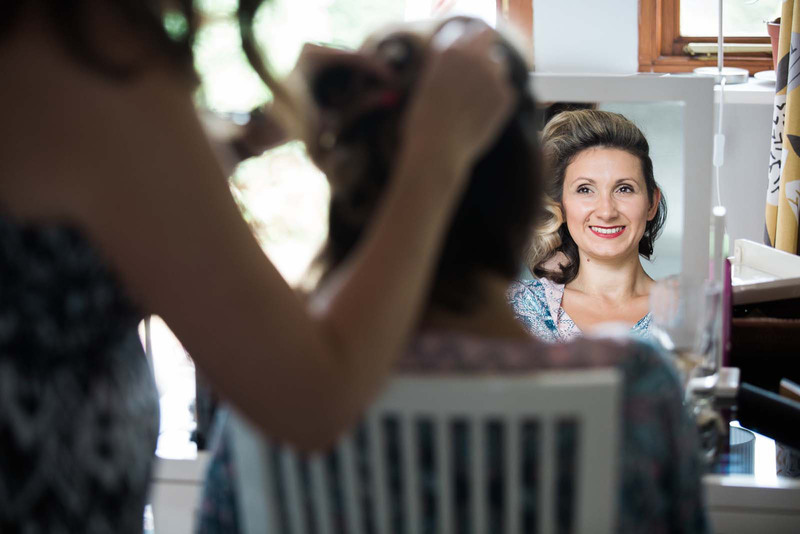 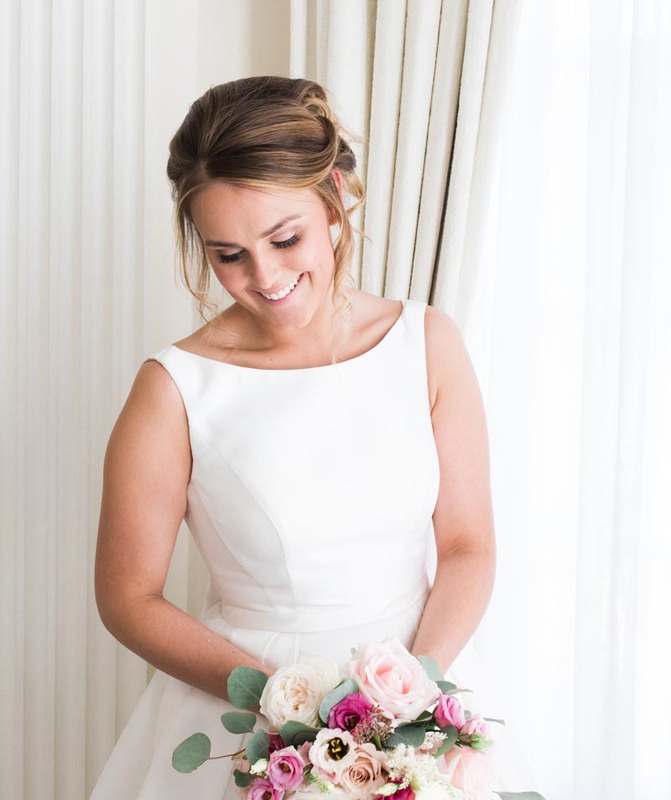 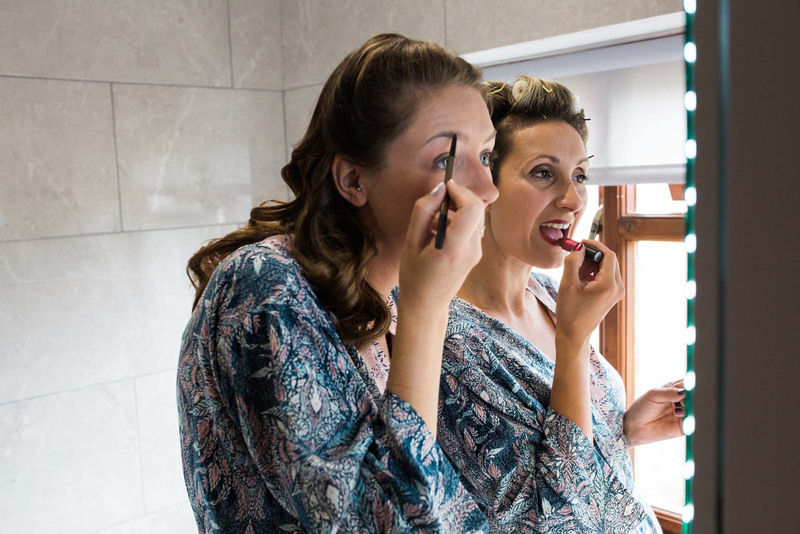 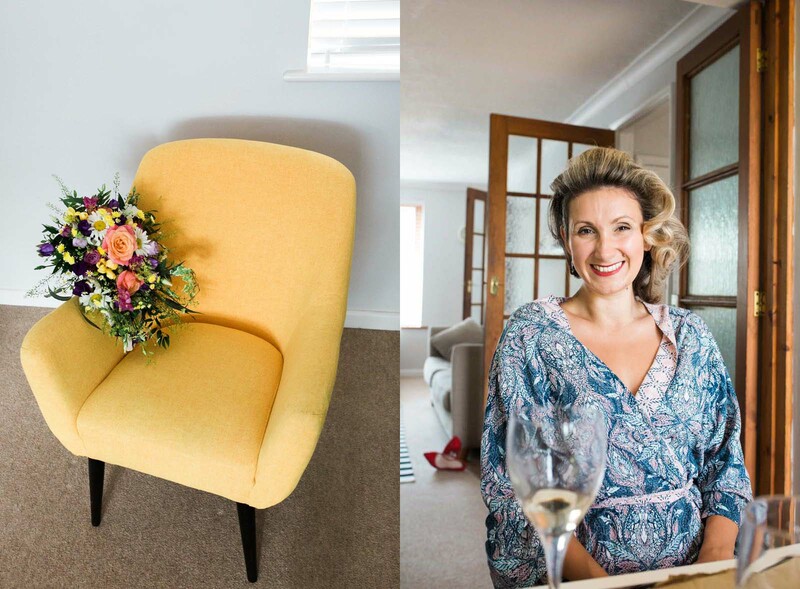 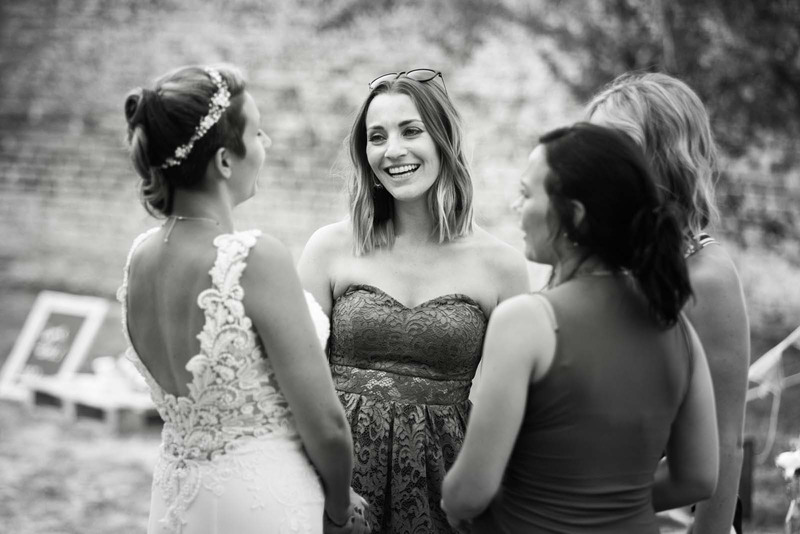 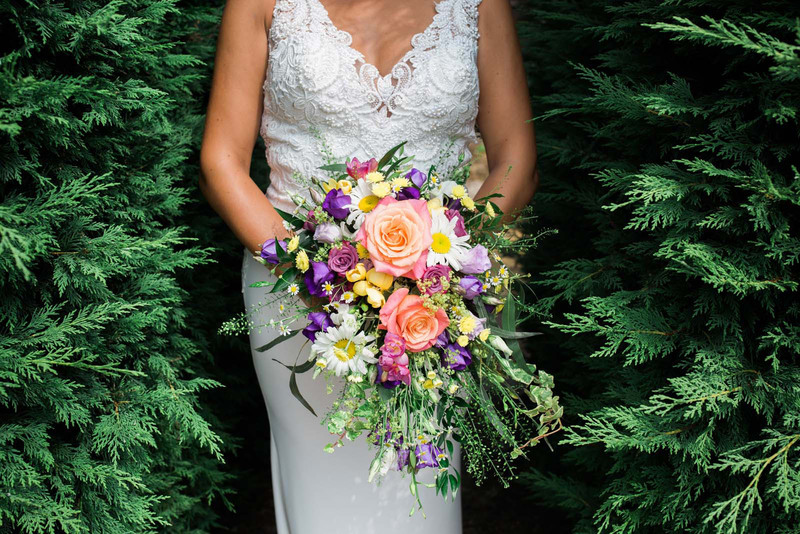 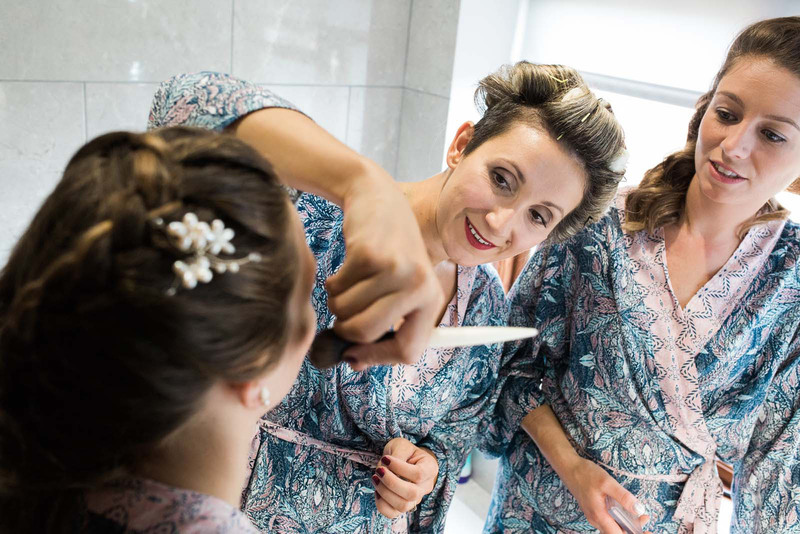 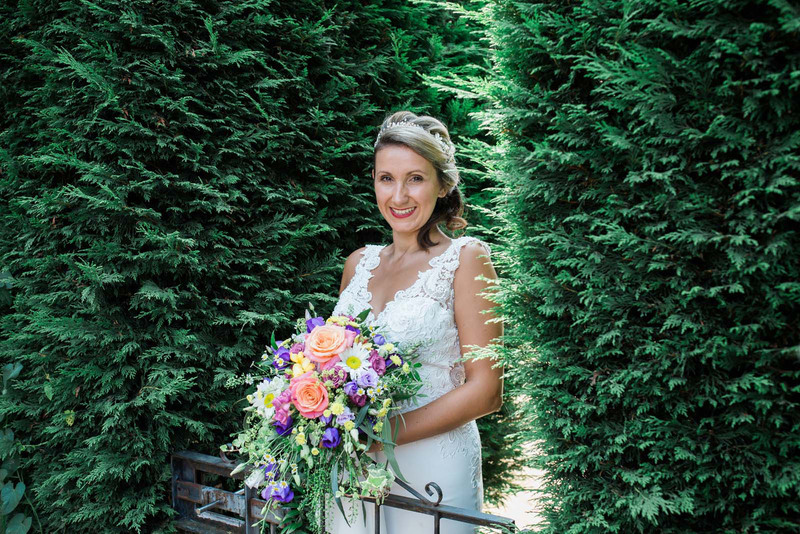 Tara got ready in Henley-on-Thames with her daughter and bridesmaids. 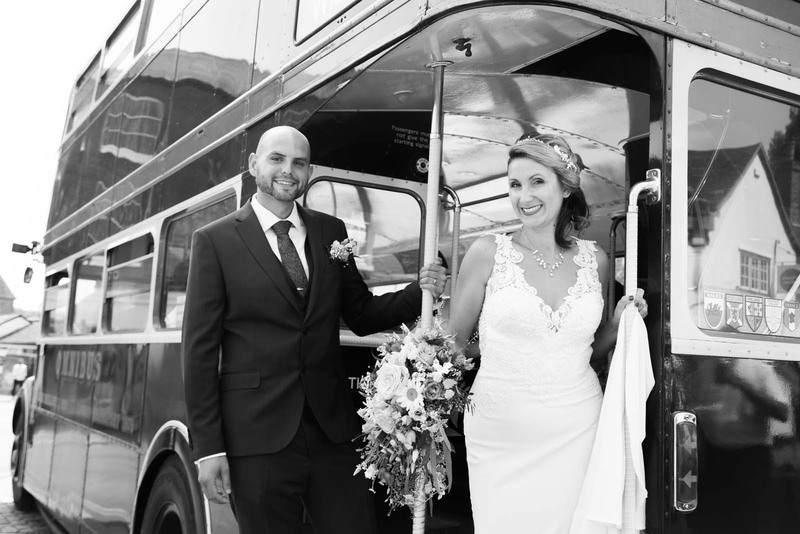 The vintage bus supplied by The Big Red Bus Company carried the Bridal party to the Henley Town Hall. 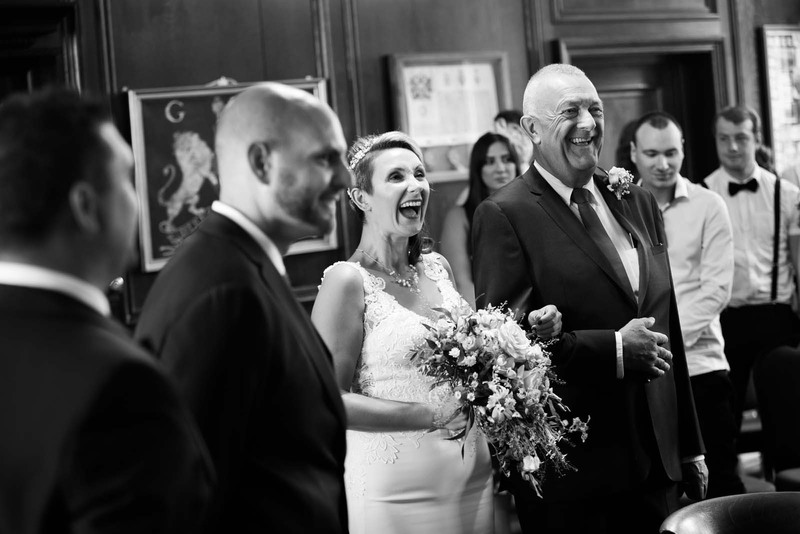 It was there where Tara and Paul exchanged their vows. 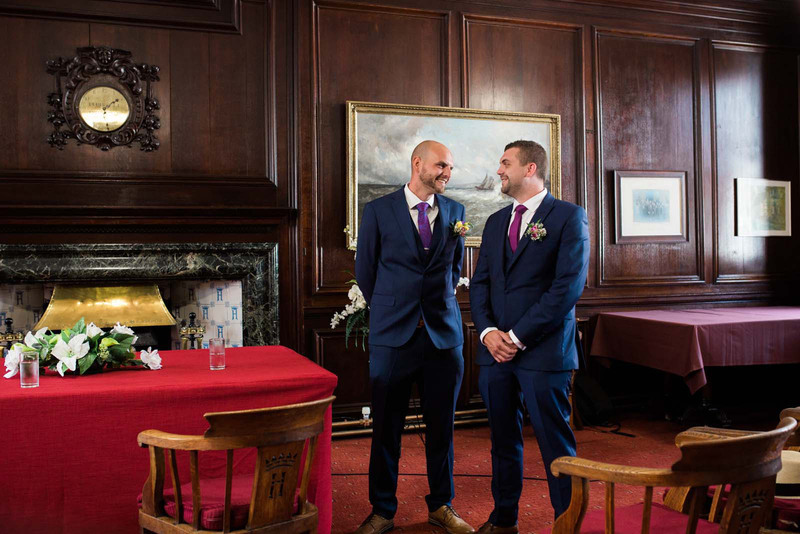 The Council Chamber at Henley Town Hall was the location for the civil ceremony. 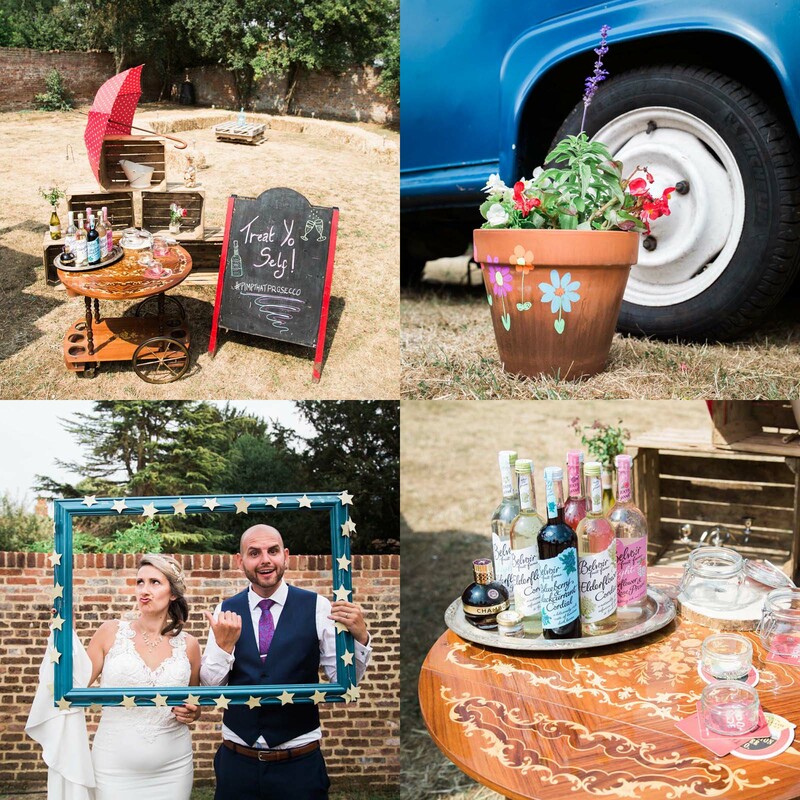 In true vintage style the guests arrived by bus. 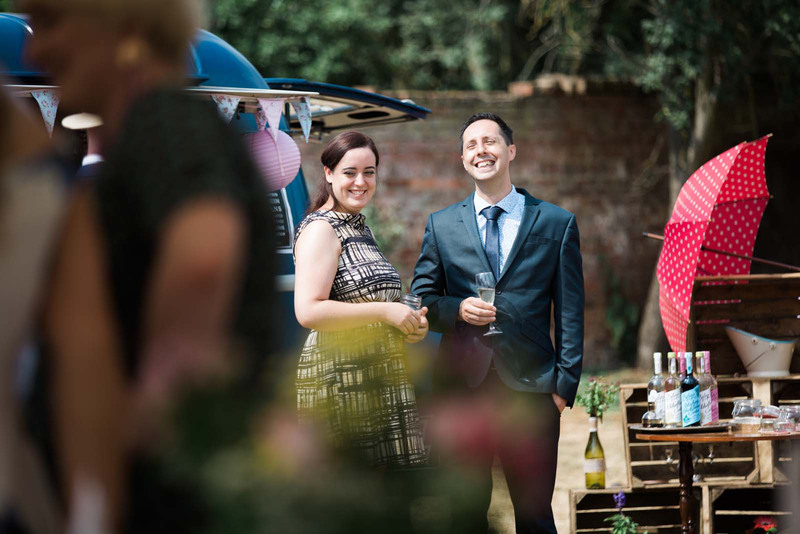 Then after the kiss guests boarded the bus again to travel to Remenham Parish Hall for the reception. 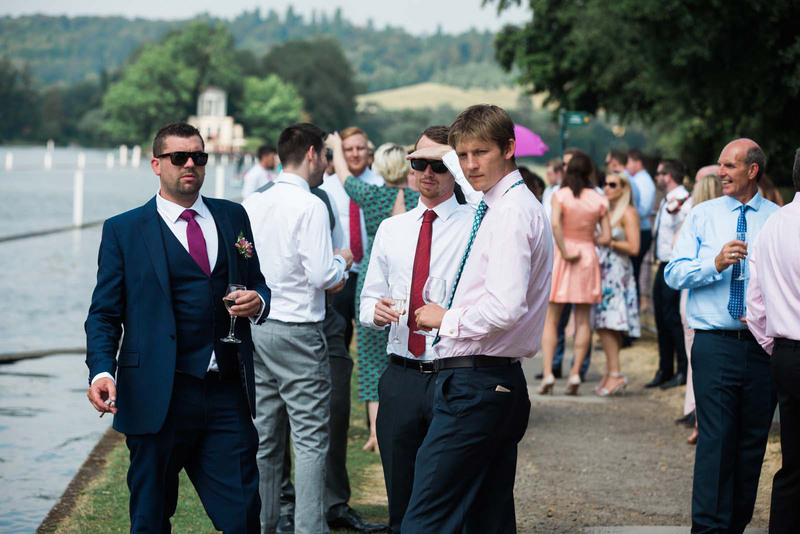 The reception was a short walk from the river bank at Remenham Parish Hall. 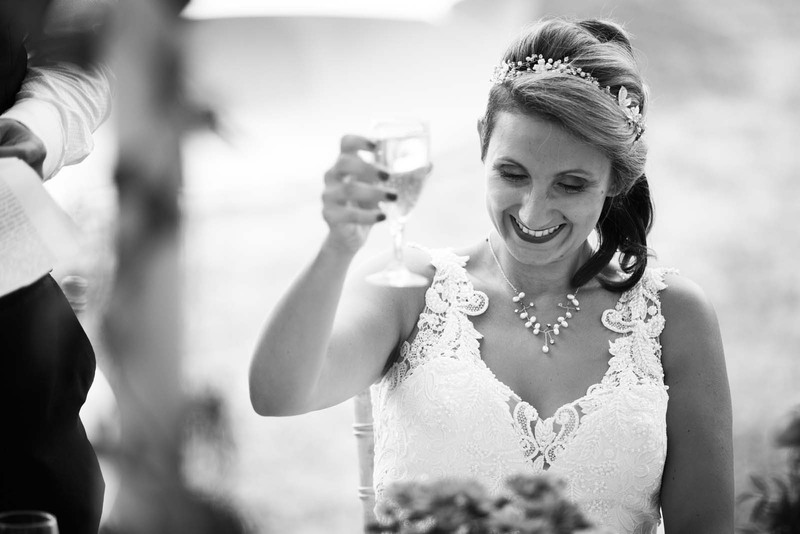 Guests walked down and welcomed the couple with champagne following their boat trip. 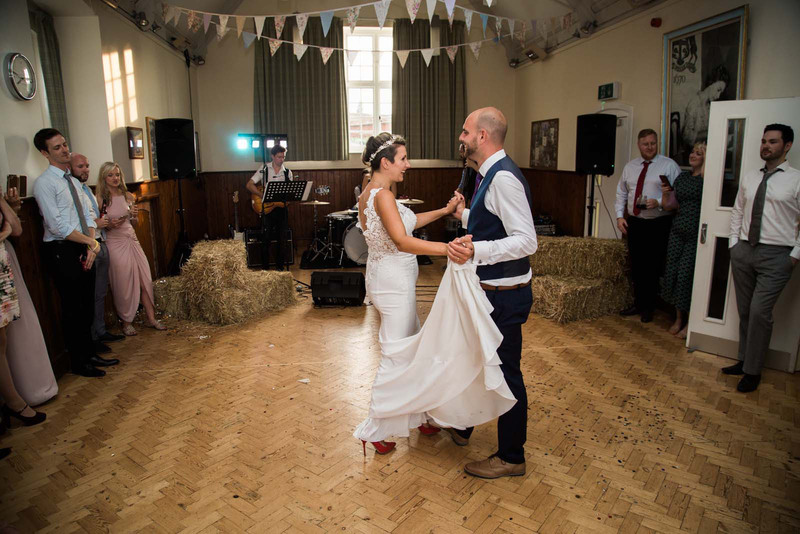 Tara and Paul transformed the space with art installations and many creative elements. 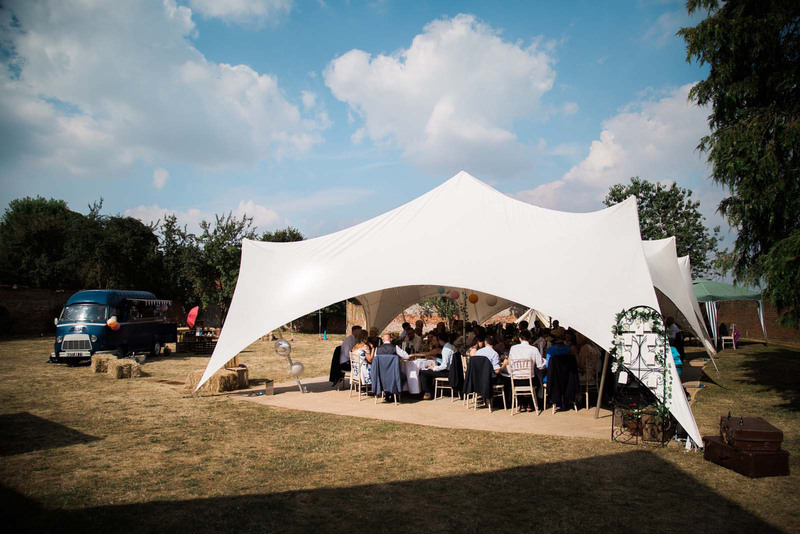 The marquee also created a welcome shelter from the wonderful sunshine. 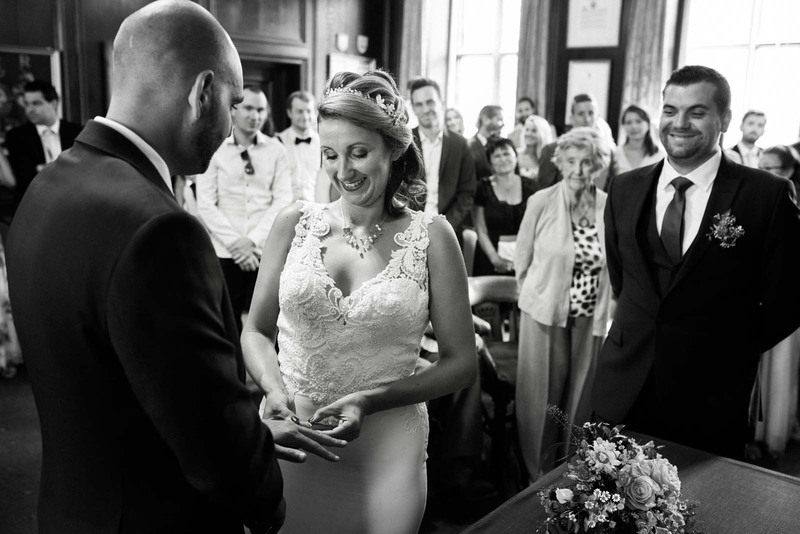 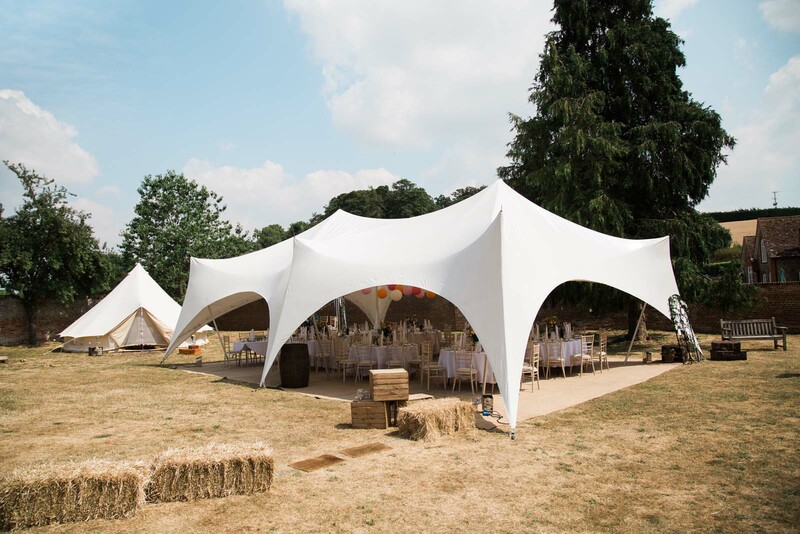 This wedding was hands on project for Tara and Paul. 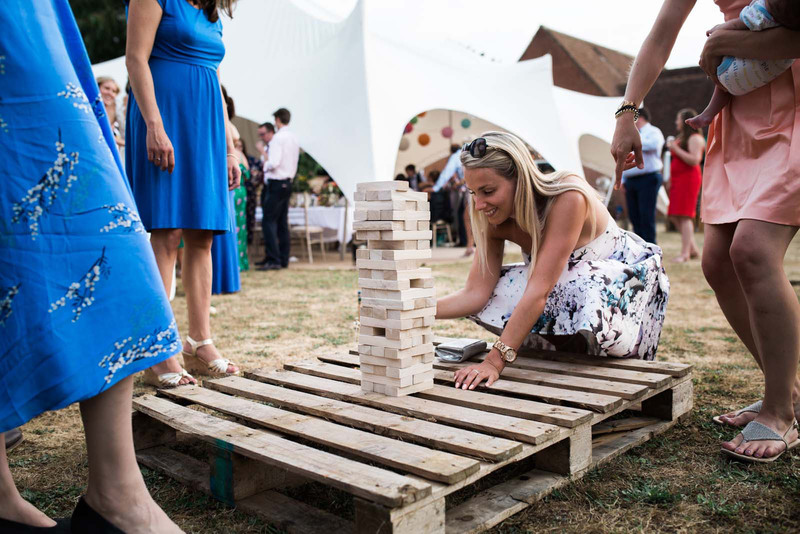 Involved in every single detail they ensured there were plenty of entertainment. 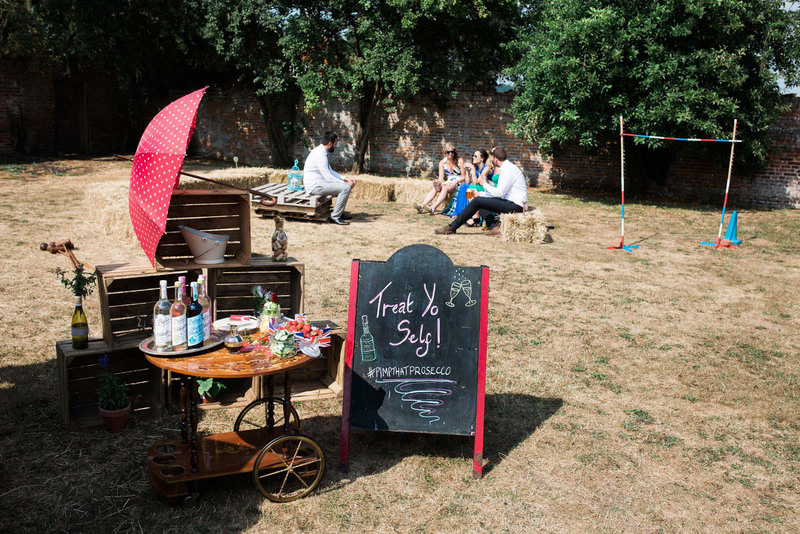 They transformed the space with art installations and creative elements.